Avocado is a large, pear-shaped berry. It has a single large seed surrounded by buttery pulp and hard skin. The outer skin is yellowish-green to maroon or purple in color, while the soft flesh is a pale yellow-green. The flesh has a texture similar to a firm ripe banana, smooth and buttery, with a faintly nutty flavor. This lends itself to a various recipes ranging from sandwiches and salads to smoothies and milkshakes. The glycemic index of avocado is 15 which falls under low GI category and the glycemic load of ½ cup of chopped avocado is 1. Is Avocado safe for Diabetics? The carbohydrate containing foods are ultimately converted to glucose during the digestion process and is responsible for the raise in the blood sugar levels. While ½ cup of avocado has a glycemic load of 1 due to just 6.3 grams of carbohydrates, it is an ideal fruit option for diabetics. However the fat content in ½ cup of chopped avocado is 11 which makes it a calorie dense fruit (120 calories). 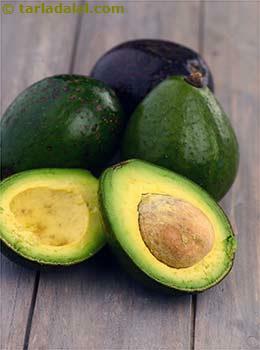 The majority of the fat found in avocado is monounsaturated fats (MUFA) which tends to reduce bad (LDL) cholesterol. But still you have to be cautious with the portion size of this fruit. Avocado being a rich source of fiber, helps in slow absorption of nutrients and thus manages blood glucose levels. Its richness in the macro mineral potassium helps in regulating blood pressure and improves muscle contractions. It is a good source of folic acid that helps in decreasing the homocysteine levels which has a negative impact on heart health. Is Avocado suitable for Weight Loss? Including fruits and vegetables which are low in calories and high in fiber is necessary for an effective and healthy weight loss. However, avocado is a fruit with good amount of fiber (5.02), it is relatively high in calories and the fat content in avocado should be taken care of. In fact, ½ cup of chopped avocado provides around 120 calories and 11 grams of fats. Fiber content in avocado helps in controlling the appetite without remaining hungry. Thus attention should be paid on the serving size due to the high fat content which can add on extra pounds quickly. Hence, moderation is important.